Social is inextricably tied to corporate culture and business structure. Social is about more than marketing, it impacts every corner of the organization. The dividends from being a social organization are just as important internally as they are externally. I’m all for social business. I believe in it. I chronicle it when I see it. I weigh in on it for my clients on an ad hoc basis. But I don’t provide social business consulting, for two reasons. First, I don’t think I’m qualified. Despite the fact that I’ve owned five companies and worked with hundreds of brands since 1994, I am not a business management consultant, and do not have the finance and operations credentials (in my estimation) to go there. Second, I don’t think my clients (many of whom are large companies) want to take complex, transformational, years-to-go-before-we-get-there, this changes everything, reorganize all your people counsel from their social and digital marketing consultant (even a very good one, if I may be so bold). And that’s the question. Do companies want incredibly serious business advice that impacts the core of their existence from their PR firm? I know many of the people in the social business practice at Edelman. They uniformly strike me as a smart bunch. But even though they’ve rolled out an “Edelman Consulting” brand as their business advising division, they are still marketers and social scientists at heart. I looked at the Linkedin profiles of the 8 team members listed in Edelman slide deck about social business released alongside their announcement. Even David Armano – who leads all social/digital globally for Edelman, and is by all accounts a sharp guy – is a graphic designer and creative director by trade and training. 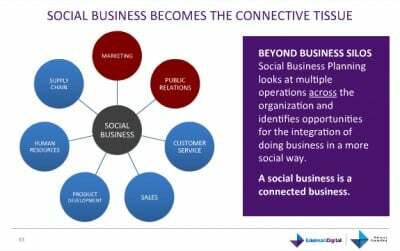 A key point about social business is that it’s not all about marketing but about the entire enterprise (as illustrated on this excerpt from the Edelman slides). If that’s the case, does it makes sense to have a group comprised almost entirely of marketers (and almost entirely devoid of degreed business experts) leading the charge? If you’re a major corporation that’s convinced you need to make some serious changes to prosper in a rapidly shifting future, do you turn to your PR firm, do you turn to a legacy management consulting firm (Bain, Accenture, McKinsey, Deloitte, et al), or do you turn to one of the new breed of specialist firms (Altimeter, Dachis, et al)? In Edelman’s case, they have laid a lot of groundwork in the past two years, and have the personnel and the client base to make this work. I think they’ll succeed in re-positioning the firm, and certainly it’s a lot easier to generate project and retainer revenue for your agency when you’re having transformative, long-term conversations with the C-Suite about social business. This move elevates them in the vendor hierarchy. But what about the other shoe? What happens when second, third, and fourth-tier PR firms, digital agencies, and other flavors of marketing-oriented professional services firm decide that social business is the new ticket to revenue generation and credibility? Will companies take serious business advice from their agency? Is Edelman the exception that proves the rule, or just the first group to have the unabashed cojones to crash the party?